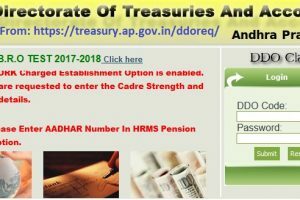 Andhra Pradesh DDO Request and AP ddoreq for Generating AP Treasury Government Employee Salary Pay Slip / Bills Online at treasury.ap.gov.in/ddoreq/…. With technological advancements, it is now possible for anyone to prepare and submit salary bills online thanks to the support given by Director of Treasuries. This has been made possible with the introduction of a new website known as DDOREQ / DDO Request Salary Bills. This website is mainly set aside for Drawing and Disbursing Officers (DDO). Through this website, it is now possible to electronically prepare monthly salary bill for every person who is employed by the government of Andhra Pradesh. Apart from preparing salary bills, this website is also used in supplementing bills, DA arrear and preparing leave encashment bills. The Direct of Treasuries has made this website user friendly by adding new features that have eased the process involved in accomplishing tasks on the website. These features include things like Updating employees leave account, CPS and preparation of supplementary bills. With the new features, all employees of Andhra Pradesh can now be able to use this site without having any problems like before. Before you can actually generate an employee’s salary bill, it is recommended that you update the leave account for every government employee who is on a pays lip. After this is done, the number of earned leaves and half pay leaves is then entered correctly in the updating tab. To access this website all you need to have is an internet connection and a device that can be able to access the internet. With all these in place, you will have to register yourself on the website from where you will be given a username and password which you will use in logging into the site. Once all these requirements are in place, you can easily log into the website using your browser on a phone or personal computer. Below is a step by step explanation on how to generate employee salary bill in https://treasury.ap.gov.in/ddoreq/ Website. 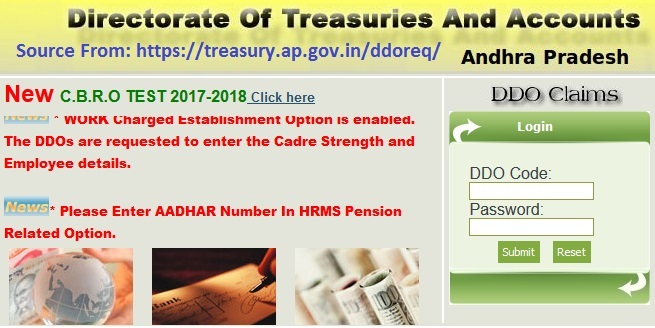 On your browser, whether Google chrome, Mozilla Firefox or Internet explorer, key in https://treasury.ap.gov.in/ddoreq/as the official link of DDO Request website. Once you have gained access to the homepage, click on the ‘Login’ button to log into the website. You will be required to put in your username and password that was assigned to you when opening an account with this website. Click on ‘Submit’ to log into the site. If you have forgotten the password, you have the option of resetting it by clicking on ‘Reset’ button from where you will be redirected into a new page. From this page, change the password to one that can be remembered easily before you can now log into this website again. After successfully logging into the website, place your mouse cursor on ‘Pay bills’ tab to select it. In the drop down box that appears click on ‘Pay bill Preparation’ button. After all the details have been correctly filled, click on ‘Ok’ to continue with the process. Now, your screen will display all government employees who are in the pay bill. By choosing the checkbox, it is possible to prevent an employee from getting their monthly salary by simply removing their name. The website does not give specific days for claiming the bill meaning it can be done at any particular time that you term appropriate. Include the EWF/FLAG in the salary bill by clicking on a corresponding employee serial number. In the next screen that appears on your personal computer or mobile phone, verify the cadre strength and click on ‘Next’ to continue. Once you have confirmed all the details, click on ‘Submit’ button to submit the information. Ensure that your manual pay bills and the pay particulars are in line before clicking on ‘DDO Bill Submission’ that can be seen from the navigation bar containing pay bills module. In the new page that appears, choose the Head of Account from the drop down box that appears. This action will make the website display a list of all the government employees together with their net amounts, deductions and monthly earnings. Click on the ‘Submit’ button once done. After clicking on the submit button, you will be required to write down a TBR number that must be linked to beneficiary bank account for employees. To link the TBR number with a bank account, click on ‘TBR Beneficiary Entry 2016’ button which can be easily traced from the pay bills menu. Enter the TBR number after which you will print the beneficiary details. If you wish to print out the Schedules, bill or Form-47, click on ‘Reports’ option that can be seen from the left navigation bar module. For generating Form-47, click on ‘Form-47 Generating’ button that is set aside for this purpose. For printing out the schedules, click on ‘Bill Schedules’ option from where you can choose the type of bill that you wish to generate. The same case applies when you want to print the salary bill since you have to click on ‘Pay Bill Details’ button.